During this hands-on workshop, Lydia Johnson will guide participants through a variety of methods of exploring pattern and form with colored clay slabs. 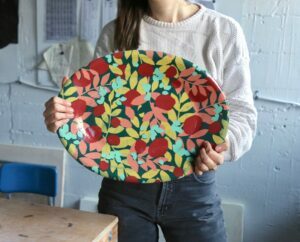 Lydia will share her unique process of using colored clay, colored slips & stencils to create patterned ceramic tableware. Through a series of demonstrations and creative exercises, students will learn how to make printed, hand built forms using colored clay. Throughout the two and a half days together, Lydia’s instruction will focus on technique and process, along with her design approach and philosophy. 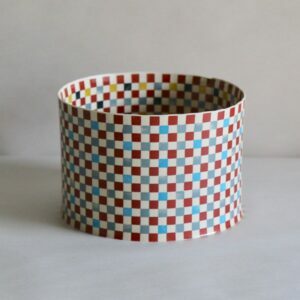 Lydia Johnson is a ceramic artist and designer who works full time in her studio in Manchester, Connecticut. Her work has been exhibited across the country at galleries such as The Clay Studio, Northern Clay Center, Arrowmont School of Arts and Crafts, Lillstreet Gallery, and Artstream Nomadic Gallery. She was the recipient of the 2017 Individual Artist Fellowship from the Tennessee Arts Commission. This spring, Lydia will be a demonstrating artist at the Florida Heat Symposium. She will also be showing work in Tokyo, Japan, and at the Architectural Design Digest show in New York City. Visit Johnson’s website or Instagram account for more examples of her work. September 13: 9 a.m. to 4 p.m.
September 14: 9 a.m. to 4 p.m.
*Workshop fee covers clay and other materials (aside from those on the “what to bring” list), continental breakfast Friday-Sunday, and lunch on Friday and Saturday. Participants will need to make their own dinner arrangements off campus. Housing is in double rooms furnished with twin beds. Bathroom facilities are shared. Participants should bring sheets, blankets and towels. Pillows are provided. Participants may also elect to stay off campus.